Last year, around Christmas, I discovered Portland, Oregon’s elusive Santasquatch. And this year? The Octicorn–plus five more reasons to visit Portland. Drink some beer. Did you know that Portland has more breweries than any other city in the world? Widmer. Hopworks. McMenamins. Laurelwood. Hair of the Dog. Base Camp. If beer isn’t your thing, Portland distilleries are popping up all over town. 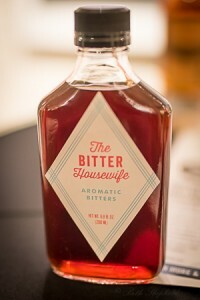 I recently tried The Bitter Housewife aromatic bitters. I swear–I’m not bitter. And if you’re not the designated driver, there are always plenty of wineries to check out. Chow down. 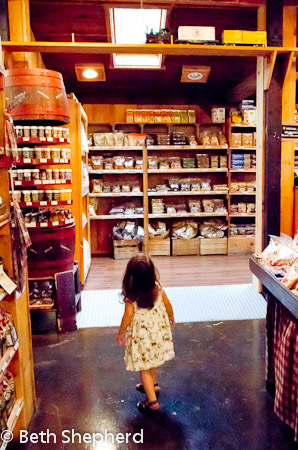 If ever there was an indie foodie mecca, Portland is it. You’ve got your restaurants, your markets and your food trucks. Over 600 food trucks! Latin, Asian, French, Pacific Northwest fusion, vegan. Coffee–some of the best bean you can sip. Like ice cream? Portland’s got it in spades. If you hit up Salt & Straw, you might even find yourself with a cone full of Pear & Blue cheese ice cream topped with bug brittle on top. For real. Doughnuts? Ditto. You can even get hitched at Voodoo Doughnut. Yep. Go outdoors. 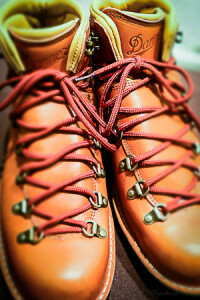 Get yourself a pair of red-laced Danner boots and walk the Pacific Crest Trail just like Cheryl Strayed. Run in the rain? Lace your Nikes up and ‘Just do it.’ Portland is loaded with parks and trails. Biking, hiking or skateboarding. Cycle around a dormant volcano? Take a hike in the largest urban forest in the U.S.? Kayak the Willamette River? It’s all there for the taking. Get your quirk on. All references to Portlandia aside, Portland is quirky. And proud of it! Facial hair, tattoos, “lumberjack couture.” In Portland you are ‘free to be’ pretty much whatever you want to be. Which brings me back to the Octicorn. What’s an Ocitcorn you ask? 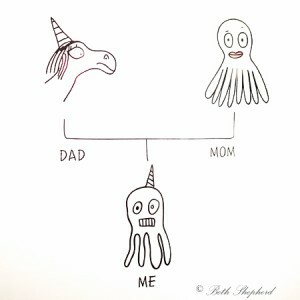 The offspring of a unicorn dad and an octopus mom, of course. And what does an Octicorn eat? 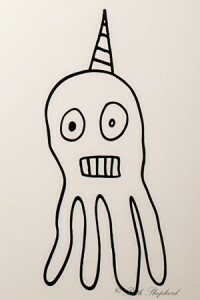 Well, from what I gather, Octicorns are partial to plankton, fresh clover and cupcakes. Because everyone likes cupcakes. What are you waiting for? Portland is Happening. Now. And if you want to read more about all things Pampers, follow me on Facebook, Twitter or RSS/email. Who’s got her own library card? Little Bird! 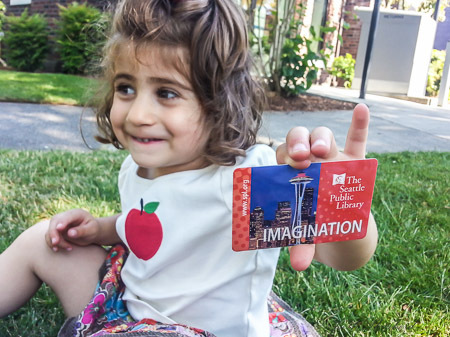 Earlier this week, the two of us went on an excursion to Seattle Public Library’s Madrona Branch to get our cards. Library cards have certainly changed since the time I had my last card. For one, you can choose the design on your card: Pike Place Market, the Space Needle, Seattle’s Central Library branch (designed by Rem Koolhaas), Mt. Rainier, a colorful children’s card, and the blue and white generic-looking card. Little Bird picked the Space Needle and I selected Pike Place Market. After we got our cards and checked out two Mo Willems dvds (Don’t Let the Pigeon Drive the Bus and others) we decided a new library card is most definitely a cause for celebration. 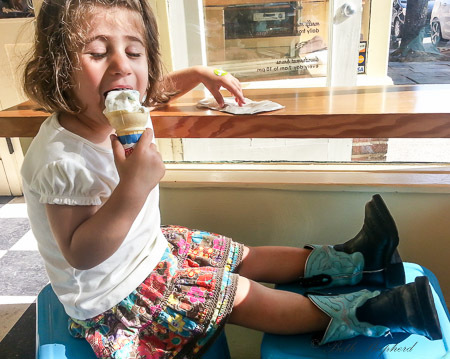 And celebrate we did with a scoop of ice cream from Molly Moon’s. I remember how special trips to the library were for me as a child. I’m so proud that my daughter loves books as much as I did, and hope her journey with books and reading continues to unfold in wondrous ways. 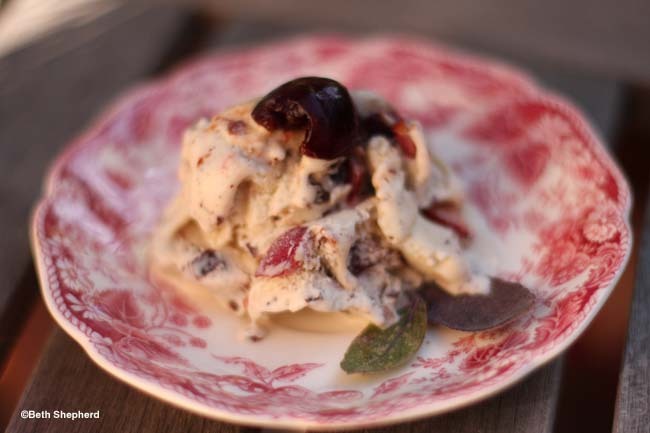 I was intrigued when I saw it on the menu at Marjorie Restaurant in Seattle: Bay Laurel Ice Cream. 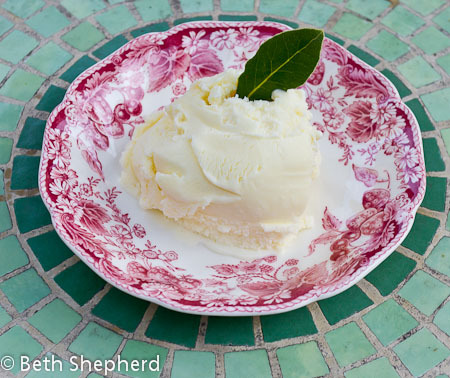 Just like the sage, thyme and lemon verbena ice creams I’ve made from herbs grown in our garden, I imagined how bay leaves, typically used as an aromatic or as a savory ingredient in soups and stews, might translate into a creamy dessert. 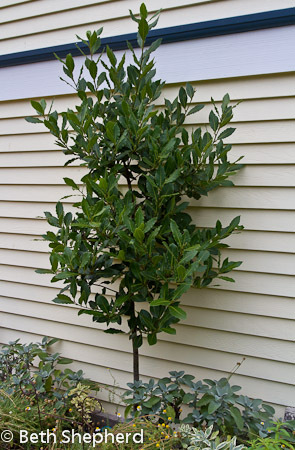 Bay leaves come from the bay laurel tree, which is native to the Mediterranean. California bay leaves actually come from a different kind of tree and have a stronger, more astringent flavor. Bay is typically used to season long-cooking dishes like soups and braises, but it can also enhance the flavor of quicker-cooking dishes like risotto, pasta sauce, or even a simple pot of rice. 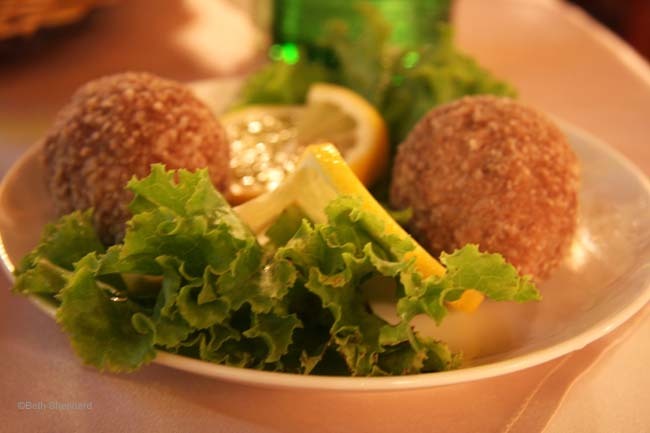 Bay is used most widely in Mediterranean cooking, but since it was one of the earliest and most widely traded spices, bay has become an established seasoning in many cuisines around the world. You can find bay in Indian dishes, Middle Eastern food, and many European cuisines (it is one of the main ingredients in classic French bouquet garni). Does bay seem like a spice that would make delicious ice cream? Probably not, but now that I’ve tried it–and made a fresh batch at home–I can say that bay laurel ice cream is delightful. 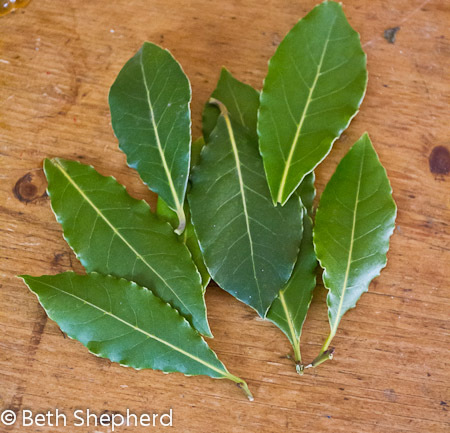 We have a small bay laurel tree in our backyard so I am lucky to have fresh by leaves whenever I need them. The fresh leaves are nothing like dried leaves you buy in bottles at the grocery store, and if you can find them (farmers market or Whole Foods-type grocery store), they are amazing: tender, fragrant and full of sweet afternotes. In a small saucepan, whisk together the milk, cream and 1/2 cup of sugar. Add the bay leaves and bring to a boil over medium heat. 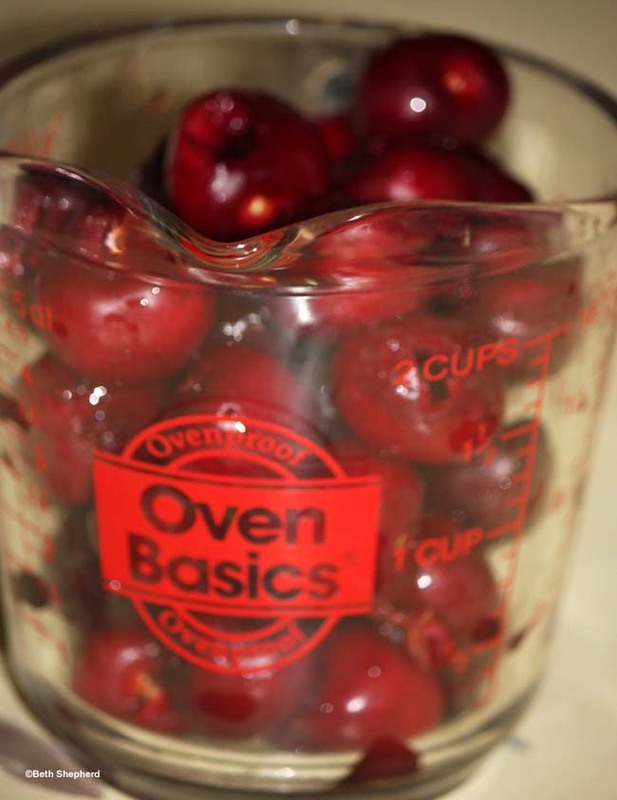 Remove from heat, cover and let steep for 30-40 minutes. Strain the mixture through a fine mesh to remove the bay leaves. Bring back to a low simmer under medium low heat. Meanwhile, in a bowl whisk together the egg yolks, salt, and remaining 1/4 cup of sugar. In a slow steady stream, whisk in the hot milk mixture a little at a time. Pour the mixture back into the sauce pan and cook for a few minutes, stirring constantly, until it coats the back of a wooden spoon and you can draw a line through it. Strain the mixture through a fine mesh strainer and into a storage container. Chill in the refrigerator for several hours or overnight, until completely cooled. Freeze the ice cream in an ice cream machine to the manufacturer’s directions. Transfer to a container and freeze. Garnish with a small bay leaf if desired. 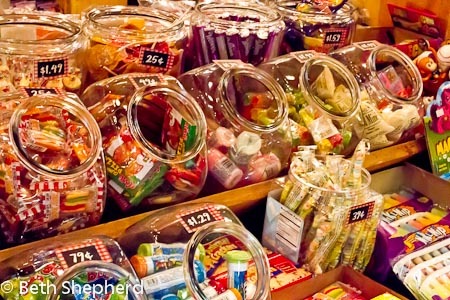 Try more sweet treats and check out Wanderfood Wednesday! When Big Papa was a little boy, he would go with his family to Soergel’s roadside stand for fresh-picked fruits and vegetables. On several of our trips to visit his family in the Pittsburgh area, we’ve stopped at Soergel’s, even though its days of being a small roadside stand have long passed. Soergel’s is over 150-years-old. 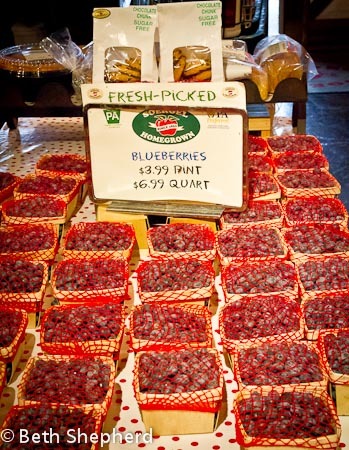 In the mid-1850’s, John Conrad Soergel, a German immigrant settled on the spot where Soergel Orchards is now. He began planting apple trees and, for several decades, the apples were sold wholesale in town. John Soergel’s descendents continue to operate Soergel Orchards. 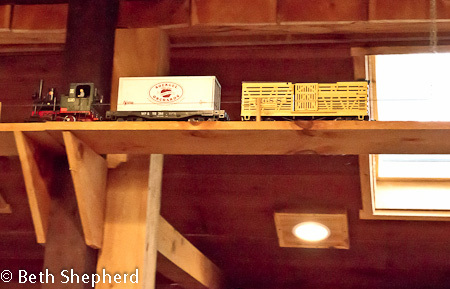 When the business outgrew its original farm stand, a larger stand was built. Eventually, in the early 1970s, the Soergel family felt it was time to expand their business further and built the market that exists today. 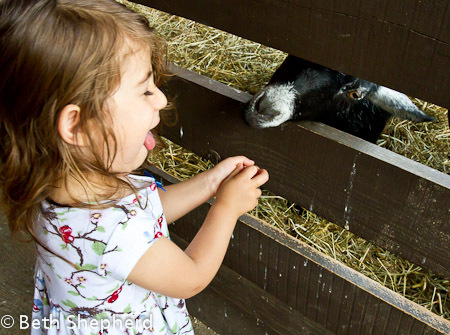 Baby Bird loved feeding the goats, staring at the enormous pig, and, when we went inside to grab a sandwich for lunch, she couldn’t take her eyes off the miniature train that chugged in circles around the ceiling. If you find yourself north of Pittsburgh, Soergel’s is definitely a great place to take kids, and it’s a lot of fun for grown-ups too. 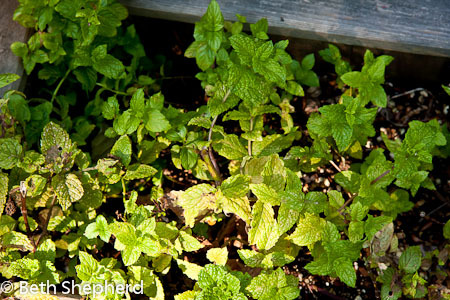 Now let me clarify: I am not talking fake, green, creme de menthe ice cream, but rather the REAL thing with fresh mint, which we happen to have growing in a mint box on our back deck (mint can take over a garden in the blink of an eye so I always corral it in a planter box). 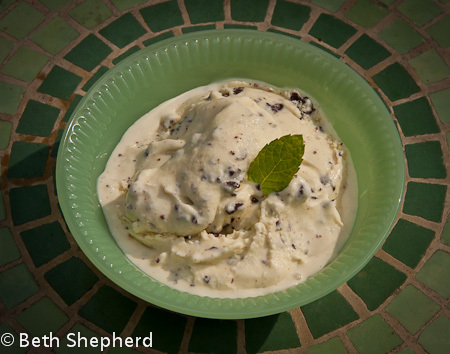 There’s nothing like mint chocolate chip ice cream made with fresh mint. 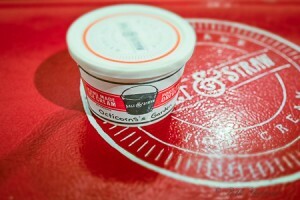 Zingy and refreshing ice cream with”chocolate chips” made from Seattle’s own Theo’s Ultimate Dark Chocolate bar. Don’t say I didn’t warn you if you can’t stop at one scoop. The bright taste of fresh mint is marvelous with the little bits of bittersweet chocolate. If you are unsure of the quantity of mint leaves, weigh them to the get the exact amount. I just stuck a few mint springs in my rooftop garden box and within a week, they took root and are thriving nicely. It’s not enough to make a batch of mint ice cream quite yet, so for now, I’m buying my mint at the market. Depending on where you shop, you might want to buy two bunches, to make sure you have enough. How to:1. In a medium saucepan, warm the milk, sugar, 1 cup (250 ml) heavy cream, salt, and mint. 2. Once the mixture is hot and steaming, remove from heat, cover, and let stand for an hour to infuse the mint flavor. 3. Remove the mint with a strainer, then press down with a spatula firmly to extract as much mint flavor and color as possible. (You can also use well-washed hands to do it as well, making sure the mixture isn’t too hot to safely handle.) Once the flavor is squeezed out, discard the mint. 4. 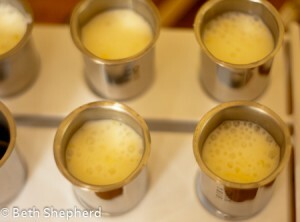 Pour the remaining heavy cream into a large bowl and set the strainer over the top. 5. Rewarm the infused milk. In a separate bowl, whisk together the egg yolks, then slowly pour some of the warm mint mixture into the yolks, whisking constantly, then scrape the warmed yolks back into the saucepan. 6. Cook the custard, stirring constantly with a heatproof spatula, until the mixture thickens and coats the spatula. If using an instant read thermometer, it should read around 170ºF (77ºC). 7. Immediately strain the mixture into the cream, then stir the mixture over an ice bath until cool. 8. Refrigerate the mixture thoroughly, preferably overnight, then freeze it in your ice cream maker according to the manufacturer’s instructions. 9. While the mixture is freezing, melt the chocolate in a small bowl over a pot of simmering water, or in a microwave oven on low power, stirring until smooth. One tip: When you melt the chocolate, make sure the bowl is clean and dry; any moisture or water will cause the chocolate to seize and harden. Place a storage container in the freezer. 10. When the ice cream in the machine is ready, scribble some of the chocolate into the container, then add a layer of the just-churned ice cream to the container. Scribble melted chocolate over the top of the ice cream, then quickly stir it in, breaking up the chocolate into irregular pieces. Continue layering the ice cream, scribbling more chocolate and stirring as you go. When finished, cover and freeze until firm. Want more freshness in your meals? Check out Wanderfood Wednesday! 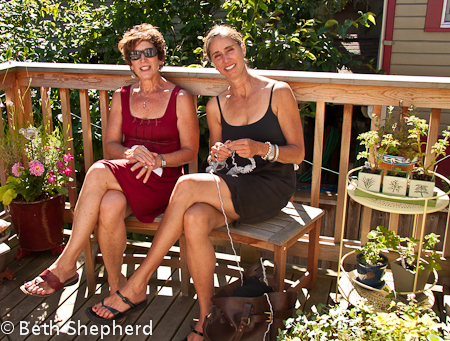 Recently, I’ve spent a few sunny afternoons in our garden with friends. Sitting together and feeling the warmth on our shoulders, sipping a glass of wine, chatting, and laughing are amongst the simplest and grandest pleasures life has to offer. On one particular afternoon, two friends arrived bearing gifts: a beautiful potted orchid, a jar of locally made Puget Sound Lavender Honey and a jar of homemade Blackberry-vanilla jam. Lucky me! I decided the honey and jam were meant to be together, and came up with the idea of creating a swirled ice cream. Instead of sugar, I used the honey to sweeten the milk and cream. Then, in the final moments, as the ice cream churned, I added a few tablespoons of delicious Blackberry-Vanilla jam to create the berry swirl. Big Papa and I enjoyed this yummy treat for dessert, and I thought about how fortunate I am to have so many wonderful friends. Here’s to la dolce vita—the sweet life—and good friends. Note: I have tried several different honey ice cream recipes, some that call for eggs and others that do not. 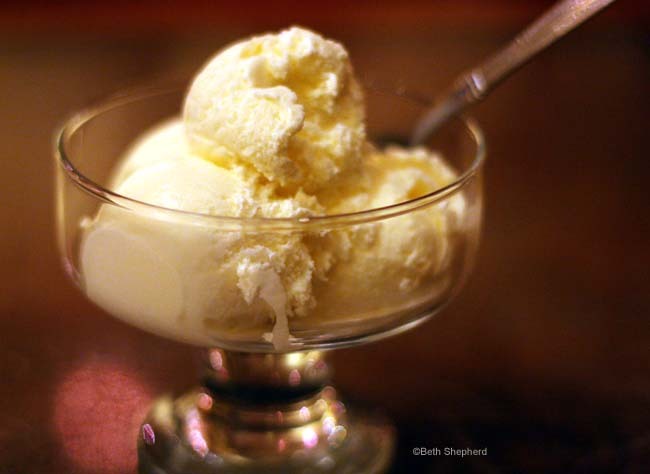 Eggs create a richer, creamier ice cream. Depending on your mood, and the flavor of jam you choose, you can use any ice cream base and any jam for swirling. Flatten the vanilla beans and cut them in half lengthwise. 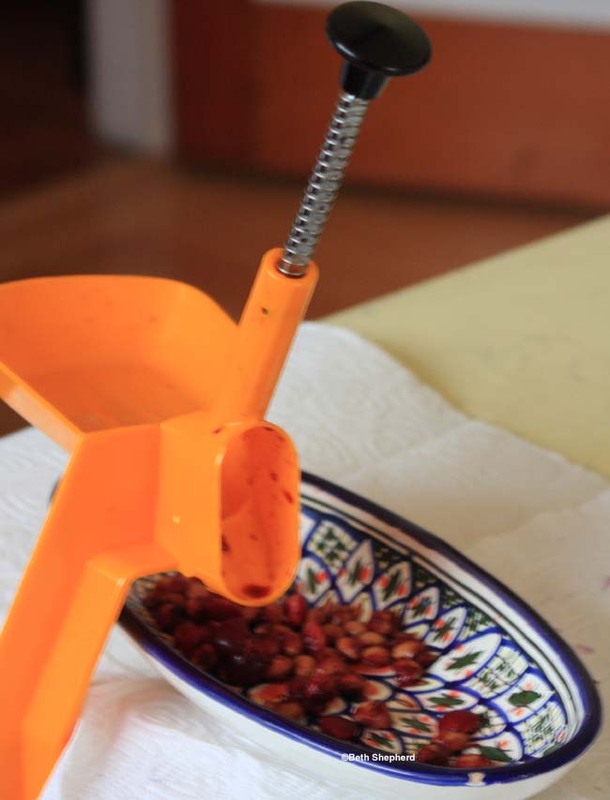 With a small spoon, scrape out the seeds. Place the seeds and pods in a large saucepan. Add the cream, milk, and honey. Stir to dissolve the honey. Heat over moderate heat, and stir from time to time until tiny bubbles form around the edges of the pan, about 3 to 4 minutes. Remove from the heat and let steep, covered, for 1 hour. Then cover and refrigerate until thoroughly chilled. Remove the vanilla pods, and stir the mixture again to blend. Transfer it to an ice cream maker and freeze according to manufacturer’s instructions. When the ice cream has set up and is nearly ready to go into the freezer, add a few tablespoons of room temperature jam (any kind will do!) and drizzle (or plop) into your ice cream maker. 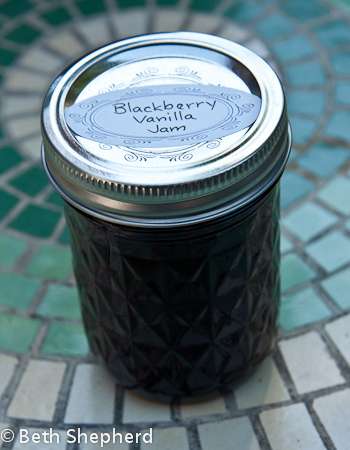 Let the jam swirl for a minute or so, before stopping the machine and chilling the ice cream in your freezer. 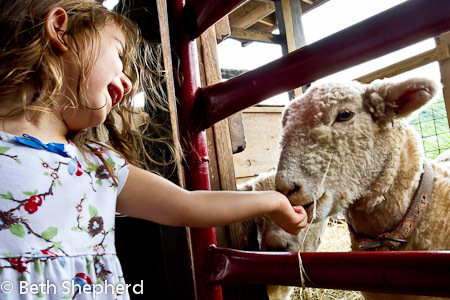 Want more sweetness in your life? Check out Wanderfood Wednesday! Give me a pint of cream, a cup of sugar, a few eggs and any random assortment of fresh herbs or fruit, and the next thing you know I’ll be whipping up a batch of ice cream. Over the past couple years I’ve occasionally blogged about the ice creamy goodness concocted in our kitchen: Honey Ice Cream and Rose Geranium-White Chocolate Ice cream and Blackberry Cabernet Sorbet are just a few of the frozen treats that have found their way to our table. So it probably comes as no surprise that when the June issue of Bon Appétit arrived at our house, with an article on frozen desserts, my mind was already churning with ideas. 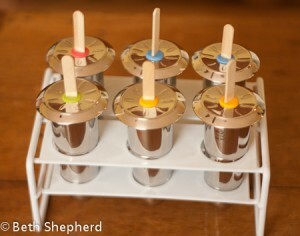 And, it didn’t take long before I a new kitchen gadget joined my arsenal of frozen dessert gizmos: popsicle molds! My groovy new popsicle molds aren’t garden variety plastic popsicle molds of yore, mind you. They are stainless steel, BPA-free retro-rockets. How cool is that? Armed with the necessary tools of the popsicle trade, I settled on a recipe: lemon cream popsicles. Big Papa and I had enjoyed a slice of lemon pie during a dinner out a few weeks ago and I’ve been thinking about the tart, creamy sweetness ever since. I did adapt the recipe a wee bit by adding a few tablespoons of Greek-style yogurt for additional tang and thickness. We loved the final result. Lemony and luscious, these popsicles are perfect for a warm summer’s day. Now if only Seattle could finally summon up a day like that! This recipe is easy as all get out! Combine 1 cup heavy cream, 1 cup milk, 2/3 cup sugar, and 1/4 teaspoon of salt. Heat and stir until the sugar melts. Then cool. Whisk in the juice and zest of 4 lemons, a few tablespoons of Greek-style yogurt (optional). Pour into popsicle molds to freeze. 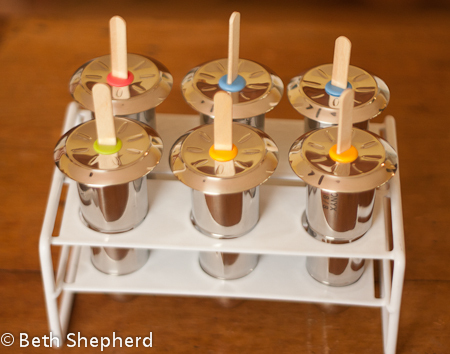 Small paper cups can be used instead of ice pop molds. Pour the mixture into the paper cups, partially freeze, then insert a wooden stick into the center of each and freeze overnight. If pops are difficult to remove from cups, cut a slit in each cup with scissors, then peel it off. Want to chill with more deliciousness? Check out Wanderfood Wednesday. 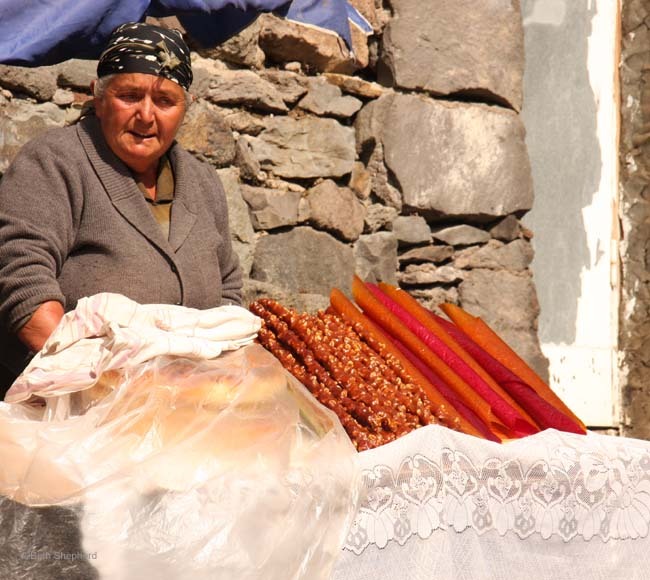 Traveling in Armenia is a feast for the senses, particularly where food is involved. 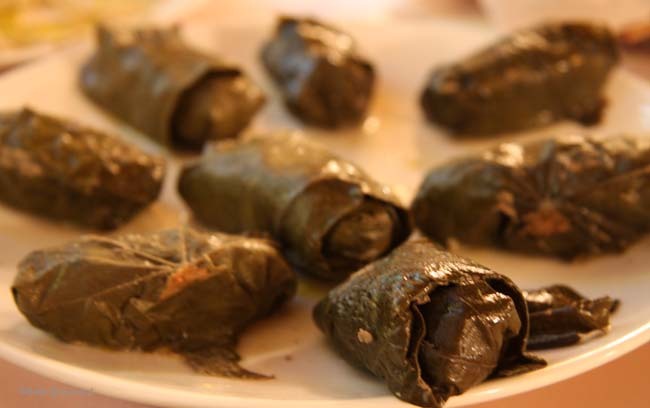 Dolma, kufta, amazing yogurt and ice cream…and of course, Pakhlava (which many other countries call Bakhlava)! 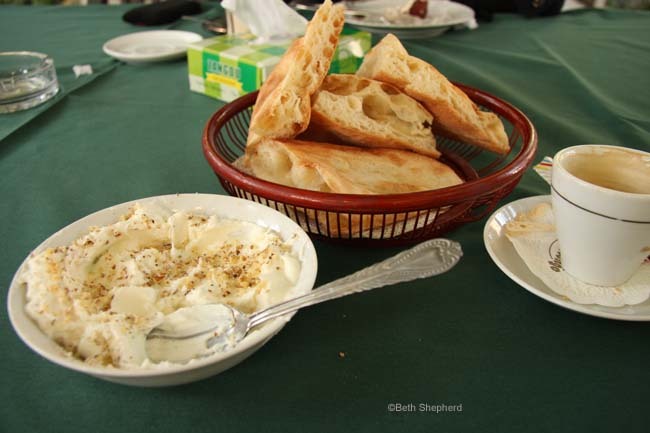 Here are a few pictures of delicious treats I enjoyed on my visits to Armenia. Want to see more deliciousness? Check out Wanderfood Wednesday! Big Papa has a picture of me sitting on his desk that was taken during my college days, back in the late-1970s. In it, I’m barefoot and wearing an Indian-printed skirt, long dark hair flowing over my shoulders. I was a hippie chick, no doubt about it. A vegetarian who didn’t wear leather, I recycled, shopped at the food co-op and lived in group house where our homemade pasta dried next to our thrift store clothes on the clothesline in the backyard. I was organic when organic was cool the first time around. Folks went gaga over Cherry Garcia along with all the other flavors of Ben & Jerry creamy goodness, so a recipe book followed. Now B&J addicts could whip up their own back at the ranch. Of course, these days all you have to do is type “Ben & Jerry Cherry Garcia recipe” into a search engine and you’ll be assaulted with a million Cherry Garcia recipe knock-offs without ever having to buy the book. 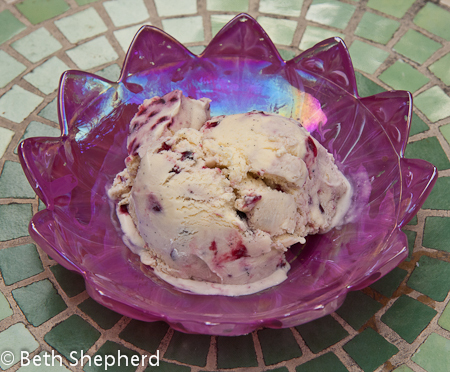 Since my fridge remains ‘cherry-laden’ after my tour of Yakima Valley a couple weeks ago, I decided a homemade version of Cherry Garcia would be just the thing to celebrate the official start of summer (at least by calendar if not by Seattle’s weather). I checked out a few recipes online and landed on one, which I tweaked a bit (as per usual with me). Let’s just say the results were [tie]-dye for! So grab that psychedelic tee tucked in the back corner of your dresser drawer, load some ‘Dead’ on your iPod and sit yourself down in the sunshine with a scoop or two. You’ll be “truckin’ like the do-dah man” for sure because this Cherry Garcia ice cream is euphoria in a bowl. Cook’s note: I confess I like my Cherry Garcia chock full of cherries and chocolate (but not smarmy sweet with jam like some of the recipes I saw). 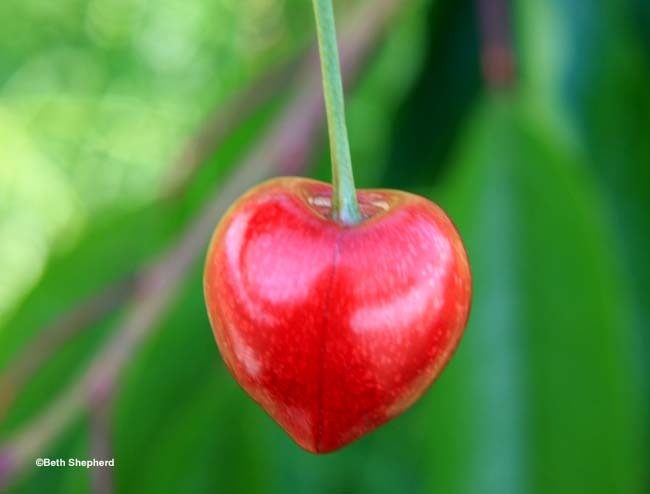 For me cherries are a good thing (healthy-antioxidants!) and chocolate is a good thing (um, antioxidants), so more of both is simply more of a good thing. But that’s me. 1/4-1/2 cup shaved dark chocolate (my version is chocolate-heavy). I use our local fav, Theo Chcolate. Chop the bar up with a chef’s knife. Place the shaved chocolate flakes and the pitted cherries in separate bowls. Cover and refrigerate. Heat the milk (or half and half), cream, salt, and ½ cup of the sugar, vanilla bean (scraped vanilla and bean “pod”) and sage leaves (slightly chopped) in a saucepan until just before boiling. Do not let it boil! Cover and let steep for a half-hour to infuse the vanilla and sage flavor. Whisk eggs in a bowl with the remaining ¼ cup sugar, and gradually add some of the warmed milk, stirring constantly as you pour. Pour the warmed mixture back into the saucepan. Cook over low heat, stirring constantly and scraping the bottom with a heat-resistant spatula until the custard thickens enough to coat the spatula. Pour the custard through a strainer into a bowl. Chill thoroughly, and transfer the mixture to an ice cream maker and freeze following the manufacturer’s instructions (about 20-25 minutes). After the ice cream stiffens (about 2 minutes before it is done), add the shaved chocolate and chopped cherries, then continue freezing until the ice cream is ready. Freeze at least 2 hours before serving. Serve with a few chopped fresh cherries and a sprig of sage. Peace, man! She’s a summer love for spring, fall or winter. She can make happy any man alive. Homemade ice cream is one of my “signature dishes.” Over the years I’ve brought quarts upon quarts of ice cream to potlucks, enough that I’ve (no modesty here) developed a stellar reputation amongst my friends for my ability to prepare this sinful (read: heavy cream, sugar, eggs) treat. My “specialty” is making ice cream using herbs picked from our garden. Fresh mint with shaved dark chocolate, thyme with honey and even simple sage (which, as a sweet treat, is amazingly delicious and perfect when paired with a garden fresh yellow plum crumble). A couple weeks ago, I cooked a traditional Armenian dinner for friends: sarma, pilaf and shish kebab. Of course, it went without saying that pakhlava would be on the dessert menu. Even though our table was laden with plenty of food to fill four happy bellies, I felt like something would be amiss if homemade ice cream wasn’t along for the ride. When Big Papa and I visited Yerevan this past September, along with the tasty Armenian cuisine we enjoyed were a few dishes of superlative ice cream. I don’t know what the “secret” was: the milk, some other ingredient or how it was prepared? No matter, Big Papa and I lapped up every last exquisite spoonful (and I, for one, would have shamelessly licked the bowl had we been in our own home). Me, myself and I debated which flavor would pair nicely with our meal. Fennel was a strong contender, but ultimately I selected a recipe where I could use the ‘Bengal Rose’ scented geraniums growing on the deck of the Urban Cabin. 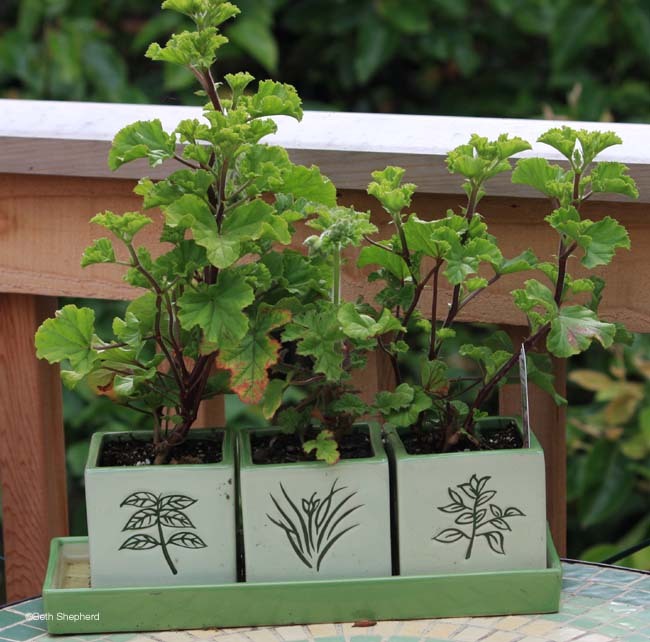 Scented geraniums, unlike your usual garden-variety, window box geraniums, have leaves that can be crushed or cut and used for various culinary purposes: baking, jam-making and, in this case, infusing into warm cream. 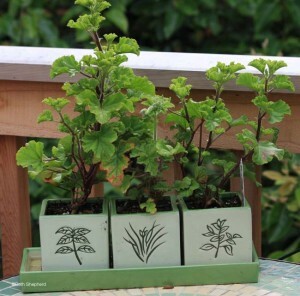 Scented geraniums come in such a variety of flavors and scents that you could designate an entire greenhouse to them. If you love apricot, they have it. If mint is your preference, taste chocolate mint and peppermint. Lemon, lime, apple, ginger and nutmeg are scented geranium flavors, too. While not traditionally Armenian per se, rose is a flavor used in ice creams (and other desserts) in Persia and the Middle East. ‘Rose water’ is typically the source for imbuing sugary delights and could be substituted in this recipe (a couple teaspoons or “to taste”) as could organic (only organic!) rose petals (say 30 or so). The recipe I found also incorporates white chocolate, and though it did add some additional richness to the final product, the next time I make this ice cream (and there will most definitely be a next time), I plan to go rose all the way. Suffice it to say that White Chocolate-Rose Geranium ice cream was a hit. 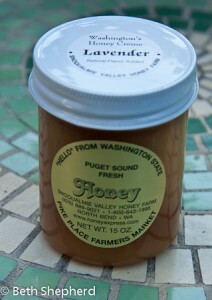 Exotic yet subtle perfumed hints of rose called to mind the summer I hope will eventually unfold in Seattle. 1. Combine milk, heavy cream and geranium leaves in stainless steel saucepan. Bring mixture to simmer over medium heat. Turn off heat. Allow leaves to steep in warm mixture about 20 minutes. 2. Meanwhile, whisk eggs and sugar in bowl. 3. Place chopped white chocolate and vanilla extract in another bowl. Set aside. 4. Using stainless steel sieve, strain cream into egg mixture to remove geranium leaves. Press any excess fluid from leaves through sieve. Whisk to combine. 5. Place ice cream base in clean stainless steel saucepan and cook over medium heat, stirring constantly, until mixture has thickened, about 5-10 minutes. Do not boil, or base will break. 6. Immediately remove base from heat. Using fine mesh stainless steel sieve, strain mixture into bowl containing chocolate and vanilla. Stir until chocolate is completely melted. 7. Cover surface of base with plastic wrap and allow base to cool to room temperature. 9. Pour chilled base into bowl of ice cream machine, and churn following manufacturer’s instructions. Remember: Many ice cream machines have bowls that must be thoroughly frozen first. Mixture should churn to relatively stiff consistency within 30 minutes in most commercially available machines. For firmer consistency, turn churned ice cream into small chilled bowl, cover with plastic and freeze for another 1-2 hours before serving. 10. Using small ice cream scoop, transfer ice cream to chilled serving dishes. Garnish each with pink rose petal and geranium leaf, as desired. Serve immediately. Want more deliciousness? Check out Wanderfood Wednesday! Some might fend off a mid-life crisis by leaving the comforts of their corporate salary to jet off to a deserted island. Others might buy a Jaguar. I’ve chosen to dive head-long into my 50s and beyond by becoming a first-time parent. At any given moment you might find me holding a camera, a spade, a spatula or a suitcase. Or my little girl's hand. Adopted from Armenia, she puts the Pampers and Paklava into my life. Unless specifically mentioned, all images on my blog are my own original photographs and, therefore, copyright protected (©Beth Shepherd). Feel free to use my images for non-commercial use so long as you provide me with the image credit. Likewise, if you pin my images to Pinterest, please mention me by name.